Steven V. Roberts speaks with Martha Raddatz and the co-chairmen of the Commission on Presidential Debates. Whether you feel the primary debates are a not-distant-enough memory or they have left you with an insatiable thirst for more policy and ad hominem sparring, further candidate-on-candidate action is in all our futures. 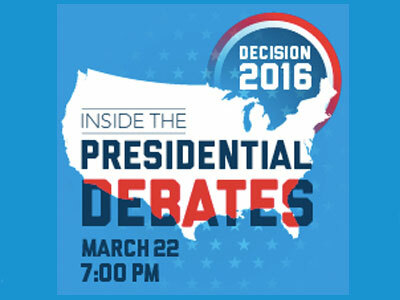 Turning to the 2016 election finals, George Washington University is hosting an event tonight that offers its audience a behind-the-scenes look at the presidential debates, as well as a discussion of debate form (for better or worse) and the influence of social media and the public on debates. Steven V. Roberts, GWU professor and veteran journalist, will moderate. He’ll be speaking with ABC News correspondent Martha Raddatz—who has two primary debates under her belt this year, as well as a 2012 vp debate—and Frank J. Fahrenkopf Jr. and Mike McCurry, the co-chairmen of the Commission on Presidential Debates. Media and Public Affairs Building, Jack Morton Auditorium.